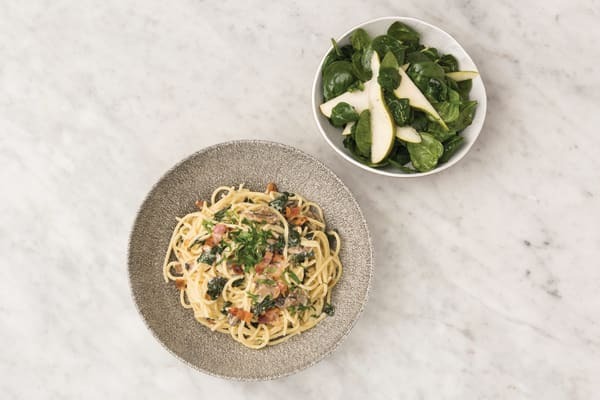 There’s a lot to love about this rich bowl of spaghetti. From the savoury bacon to the deep meatiness of the mushrooms to the gooeyness of the Cheddar cheese. But our favourite part? It’s got to be that it’s on the table in half an hour. That’s our kind of dinner! Bring a medium saucepan of salted water to the boil. Finely chop the garlic (or use a garlic press). Thinly slice the pear (see ingredients list) into wedges. Finely chop the parsley leaves. 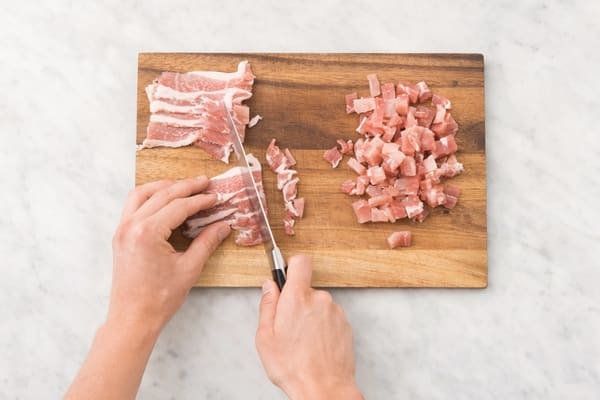 Roughly chop the bacon. In a medium bowl, combine the balsamic vinegar, honey, olive oil (1 tbs for 2 people / 2 tbs for 4 people) and a pinch of salt and pepper. Set aside. Separate the egg yolk from the egg white. 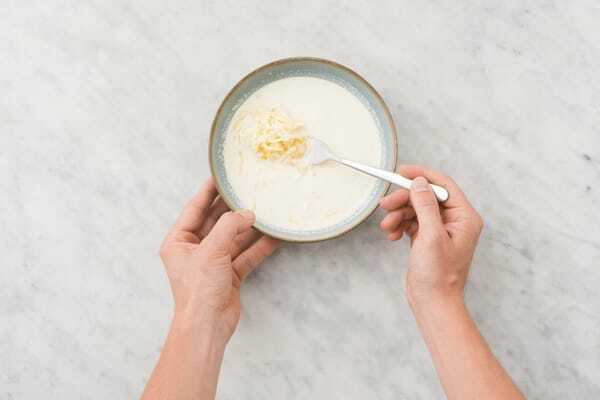 In a medium bowl, combine the egg yolk, thickened cream (see ingredients list), shredded Cheddar cheese and crumbled chicken stock (1/2 cube for 2 people / 1 cube for 4 people). Season with a pinch of pepper, whisk with a fork and set aside. 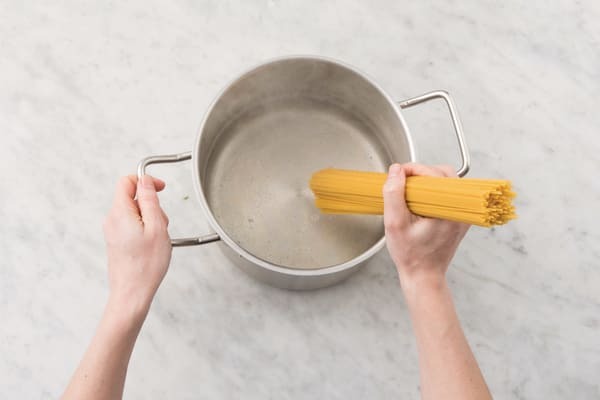 Add the spaghetti to the saucepan of boiling water and cook for 9 minutes, or until ‘al dente’. Reserve some cooking water (1/4 for 2 people / 1/2 cup for 4 people), drain the spaghetti and return to the saucepan. 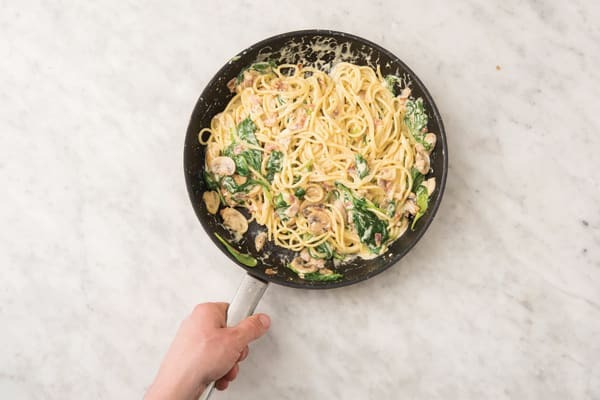 While the spaghetti is cooking, heat a large frying pan over a medium-high heat with a drizzle of olive oil. Once hot, add the bacon and cook for 5-6 minutes, or until crisp. 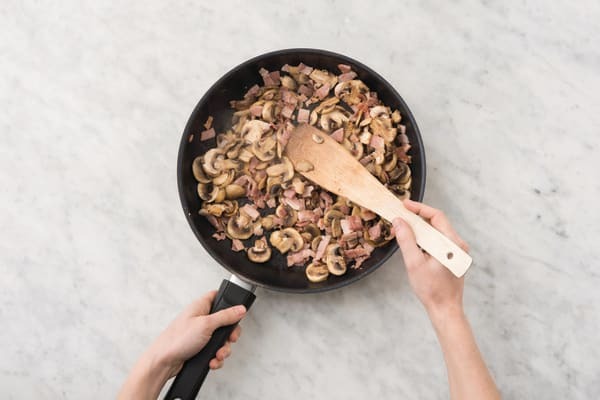 Add the sliced mushrooms and cook for 5-6 minutes, or until softened. Add the garlic and 1/2 the baby spinach leaves and cook for 1 minute, or until the spinach has wilted slightly. Reduce the heat to medium. Add the vinegar and cook for 1-2 minutes, or until evaporated. TIP: Stand back! Vinegar emits a strong vapour when heated. Add the spaghetti and creamy sauce mixture and cook, tossing constantly, for 2 minutes or until the spaghetti is coated in the sauce. Season to taste with salt and pepper. TIP: If the sauce looks too thick, add a splash of the reserved cooking water to loosen. TIP: If your pan isn't big enough, toss everything together in the saucepan! Add the pear and remaining baby spinach leaves to the large bowl with the salad dressing. Toss to coat. 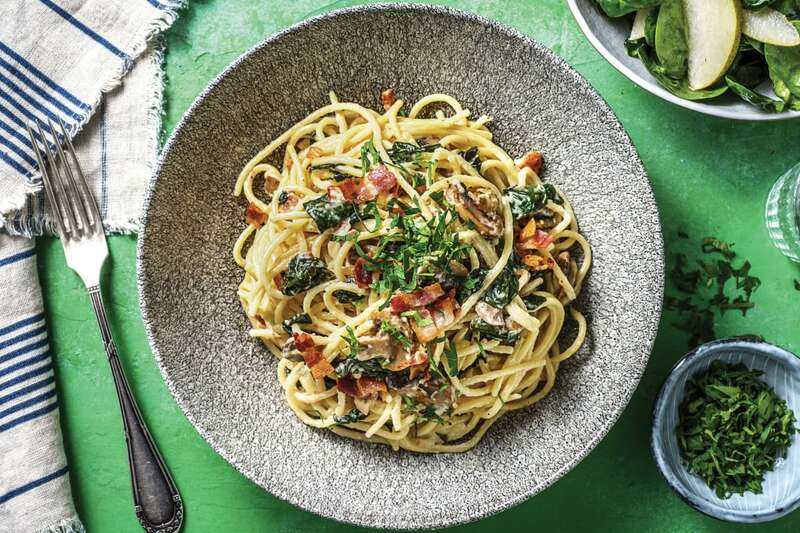 Divide the creamy bacon and cheese spaghetti between bowls. Garnish with the parsley and serve the salad on the side.